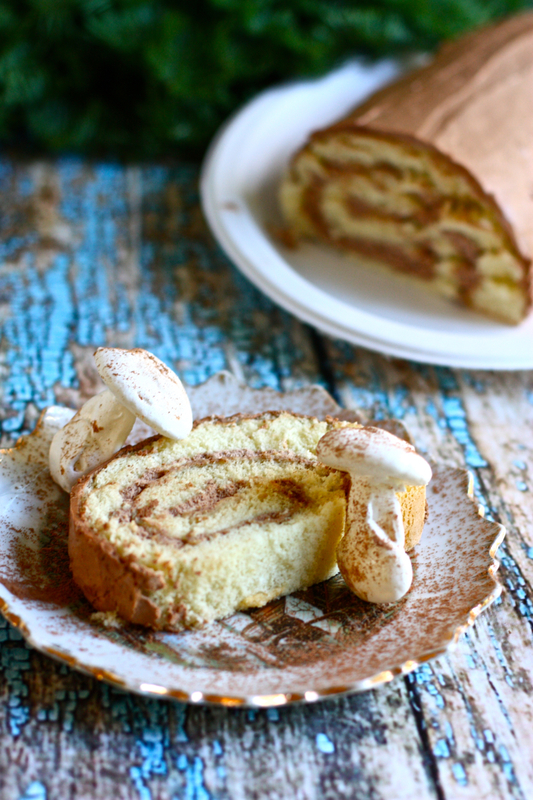 Wow, am I ever excited to share this recipe with you guys today! To do it properly though, I had to bring in some help because this was the first time I ever made étouffée, myself. So, this recipe comes with love to all you today straight from Adam’s mom, who learned how to make it from his 100% Cajun great grandma. When I was visiting Adam’s family in Texas over Christmas this past year, Nancy (his mom) made it for me and I couldn’t get enough! It’s thick and delicious with just the perfect amount of spicy kick. She made it with crawfish, of course, but I made this version with shrimp because after searching high and low, I just can’t find crawfish anywhere in the Bay Area. When I asked Nancy if she minded sending me the recipe so I could make and post it on the blog during Mardis Gras, she re-made it herself just so that she could get the exact measurements right. She told me that whenever she walked into Adam’s great grandma’s house (no matter what time of day! ), she was always greeted with the aroma of celery, onion, bell pepper and garlic cooking on the stove. She always kept an extra supply of seafood in the freezer to make this étouffée spur of the moment whenever company showed up. Nancy also said that “the best way to wake Adam up for church on Sunday was to get that blend of onions and bell peppers going on the stove so he’d know there would be a great lunch waiting for us when we got home”. I’ll have to remember that one. The key to making this is to assemble everything beforehand and have it all right next to you at the stove. It’s not difficult or time consuming, but the process moves very fast once you get started! 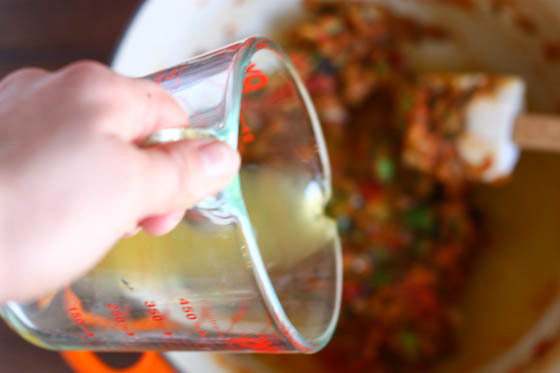 After you prepare all your vegetables and have everything next to you ready to go, make the roux. Melt the butter in a heavy pot and then sprinkle over with flour. 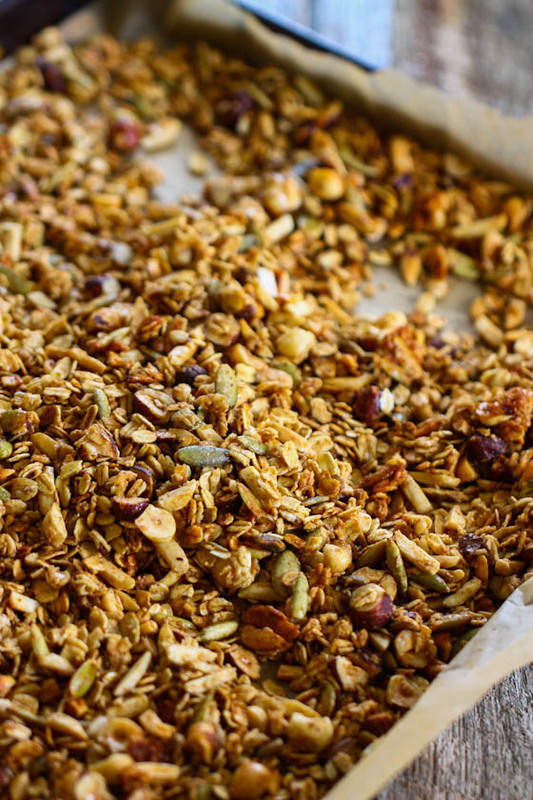 Stir until it takes on the color of peanut butter and smells nutty and delicious. Add the vegetables to the bubbling roux and cook until they begin to soften and wilt. 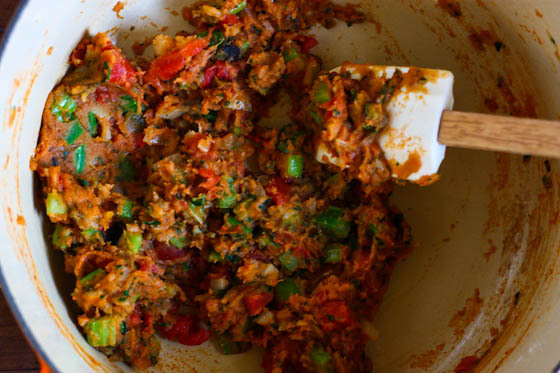 Once the veggies have softened, add the diced tomatoes and chilies (Rotel!). It’ll get super thick. Then, pour in the seafood stock! Nancy said to use about two cups, but I used more…closer to three cups. You want the étouffée to be thick, but not ridiculously thick—-think of it like a thick pasta sauce. Now add your spices! Tony Chachere’s Cajun seasoning, cayenne pepper, Worcestershire sauce and Louisiana hot sauce. Bring to a boil and stir. Finally, add the shrimp (or crawfish). Reduce heat to low and simmer until seafood is done. Serve your étouffée with extra hot sauce! I like my étouffée served over white rice but Adam loves his spooned over mashed potatoes! Just try it. 2 lbs raw, deveined shrimp (tails off) OR 3 lbs crawfish tails if you can find them! Assemble all ingredients before starting to cook! Melt the butter in a large heavy-bottomed pot over medium/high heat. Once melted and bubbling, sprinkle the flour over top and mix with a rubber spatula until a smooth paste forms. If your paste is very thin, add a little bit more flour. Keep stirring and cooking over medium heat until roux turns the color of peanut butter. It will smell nutty and delicious. Add the chopped onions, celery, green onions, bell pepper, garlic and parsley to the hot roux. Cook the vegetables until they soften—about three to five minutes. Stir continuously. Add the diced tomatoes and chilies along with seafood stock. Add additional stock if mixture looks too thick (I added extra). It should be thick, but be a sauce-like or stew-like consistency. Mix well so there are no lumps. Add cayenne, Tony Chachere’s, Louisiana hot sauce and Worcestershire sauce and stir well. Bring mixture to a boil and slide in shrimp. 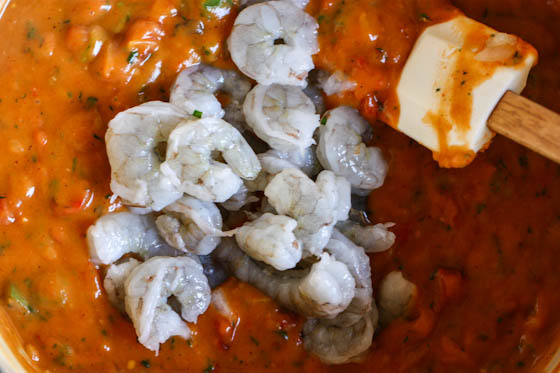 Reduce heat to low and simmer until shrimp are done, about 15 minutes. 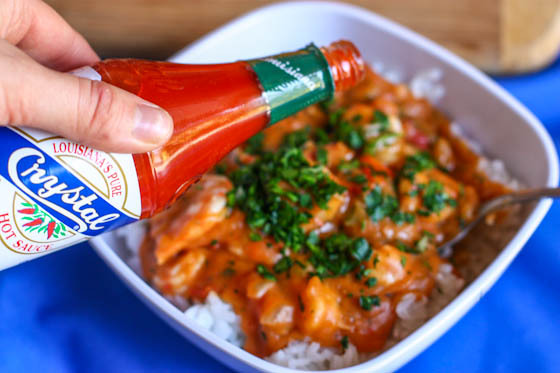 Serve Étouffée with rice, mashed potatoes and/or crusty rolls for dipping with extra Louisiana hot sauce on the side! Never heard of this before. What size and type of pot do you use for the stove? Celery…why must I hate it so much? It’s in everything! Oh my gosh…no kidding, just YESTERDAY I was looking over all of the food blogs I follow for an etouffee recipe. Not a one. Now, today, I see this. Hilarious! And awesome. I’m going to try it sooooon! have never heard of this dish before, looks good from the pictures, I have one package of frozen jumbo shrimp, maybe I can give it a try during the weekend! Although I love some Sriracha, Crystal hot sauce will always be my ultimate fav! you make me so happy!! I’ve been waiting for this recipe and it looks amazing as ever! I have a whole bottle of Crystal sitting in my fridge, ok, half a bottle..but I can’t wait to make this! absolutely delicious looking!! Looks great! Loving all the savory recipes recently – thanks!! I’d never even heard of étouffée before this but after this post I know one thing for sure: I want it. this looks so delicious and simpler that I thought! Heading to New Orleans this weekend so ill have to try some down there and then compare to this!! thanks for sharing, Jenna! This isn’t the type of dish that I would eat (or my bf), but I really love the story behind it… thanks for sharing it! I’ve never had Cajun food before. Thanks for sharing this and the step by step pics. It’s always nice to know if I’m doing it right when I start making this. but this etouffee looks wondeful. thank you so much for the recipe! What a fantastic recipe! I’ve never even heard of etouffee before today, but now I’m kinda craving it. Any chance this would courier well up to Canada?! Cheers Jenna! I love that you posted this! I’m from Texas so I think Cajun food is one of the best genres out there! My husband’s family is Cajun and it’s always a treat to visit them in Lafayette and have them make crawfish etouffee. His mom uses four sticks of butter though…yikes! This looks GOOOOD. For some reason I just don’t like shrimp (or any shellfish) though, despite being from Maine. (I do love fish and mollusks.) I know this might sound sacrilegious, but I might make this with chicken instead! I know that would make it into a different dish, but the general recipe seems very modifiable, if you’re not concerned with authenticity. It even seems like it would be delicious turned into a vegetarian dish with tofu! I made it with veg stock & extra bell peppers to make it vegetarian! I’m in disbelief at how good it is!! Thanks Jenna!! Glad to know it can be veganized, no problem! That’s awesome! My husband and I were just talking about making this yesterday! Now on to find some seafood stock! Thanks Jenna! It’s right below the chicken stock at the grocery store! Hope y’all love it! That is so easy!! I’ve heard of this but have never made it! It serves about 6-8 people…the two sticks of butter just makes it extra delicious. Anything with garlic is an A+ in my book. Seriously can’t get enough of it. This looks insanely delicious – I’m just developing a new obsession with Jambalaya (sp?!) and this looks like something new I could get stupidly into!! OOOOOOOOOO this is my kind of dish!!! i love this! I remember my mom making this growing up!! ohh those were the day. over mashed potatoes? really? i’ve always had it over rice. Did you try it over mashed potatoes? did you like it? I tried it and it was little too much for me…but I’m not a huge potato person anyway. I’ll take rice over potatoes any day (it’s all about texture for me)! I have never heard of Étouffée before. This must be because I am not from the south. But, as a child of the Pacific Northwest, I can attest to eating many crawdads (caught my self!) as a summertime snack. Not quite the same though. Jenna, this looks great. Any way it could be lightened up? If I used one stick of butter would it totally change the taste? It would change the proportions for the roux and thus, change the texture…I would make it with two sticks of butter and serve a large group! It’s not something you eat everyday. I’ve only had ettouffee once (in Houston last year) but I absolutely loved it. Thanks for this detailed recipe! I guess I know what I’m making this weekend!! Jenna this is gorgeous! And thanks for the detailed recipe lesson…appreciated very much! As a fan of anything shell fish, this recipe definitely shouts out to me. I love the cajun-style spin and could see myself making a huge batch of this recipe for my family. I really enjoy browsing your site and would like to give you the Versatile Blogger Award (if you need more details, just go to my site 😉 Congrats, girly and have a wonderful day! Thank you so much for posting this recipe. I had etouffee for the first time in Minneapolis a year ago; and it was great! I have been searching the internet for recipes, but seeing the step by step pictures is awesome. I will be making this soon! I live in South Dakota, so nobody has even heard of etouffee, much less knows how to pronounce it! how important is the flour? I can’t do gluten, so would it totally mess things up if I didn’t use it? Unfortunately the flour is crucial! It’s what makes the roux, which is the backbone of the dish and is what thickens it up. 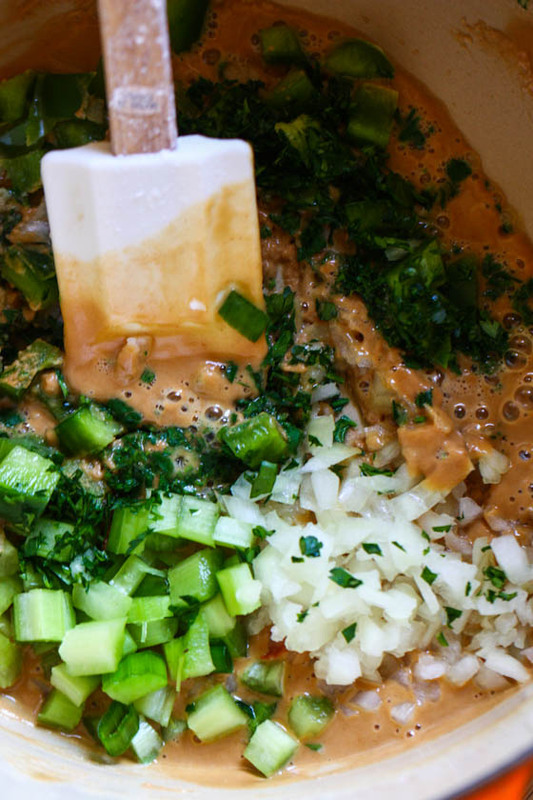 You can make gluten-free roux, and gluten-free étouffée. Simply google it for recipes! (for example, you can substitute the wheat flour with a gluten-free variation, such as corn starch or tapioca starch. Both thicken very well). I have also used cream of mushroom soup mixed with a little Kitchen Bouquet. I works well too. Being born in Lousiana and 1/2 Cajun, I love eh-two-FAY! There is nothing else like Crawfish Étouffée. I can’t wait to try this! Unfortunately my grocery store didn’t have seafood stock. Do you think vegetable broth be ok? Seafood stock is kinda important for the overall taste of the dish..especially if you use shrimp instead of crawfish (crawfish are way more “seafoody”….do you have a whole foods or more gourmet store in your area that might have the stock? If not, I would suggest using chicken broth. I have yet to meet a Cajun dish I don’t love, but I don’t know that I’ve ever had etouffee of any variety. I think its long overdue that I change that. There was a place where I used to live that had the best crawfish etoufee. I seriously miss eating there! I am going to have to make this recipe ASAP! using your exact recipe, on a scale of 1 to 10, 1 being not spicy to 10 being spicy as all hell, where would you gauge it? I love a little bit of spiciness to a dish, but my stomach can’t handle anything over a 5. Ok…I would say…….maybe a 4-5? Its not really spicy…it just has a mild kick to it. To lessen the burn, leave out the cayenne pepper! Sounds delicous! But I need to learn how to pronounce it first before I make it! This looks so good except i really want it to be chicken lol any way I can make it chicken instead of seafood? This dish defines comfort food for me!!! This looks really neat! I don’t eat meat but I can see it being great even without the shrimp. Etouffee is my all time favorite. I cannot wait to try this recipe. Thanks so much for sharing it. As a born and bred South Louisiana Cajun girl, I must say that this recipe looks perfect (esp. the stick of butter per pound of seafood ratio). I always try to “healthify” our crawfish etouffee by reducing the butter, but my husband says that he can always tell the difference. I really don’t think you can. How wonderful of your boyfriend’s mom to share this treasured family recipe with you! I know (and am a member of) a huge cajun family and recipes passed through the generations are like precious gems………………………they are only given to a VERY SELECT few. As for the amount of “fish” stock, people who are old friends of crawfish know that they are “sweaty” little guys and can be fatty as well. It is always best to use less stock. If you don’t , you may end up with soup! If it turns out that you have a less juicy batch of crawfish, you can always add more later. My husband is a true, expert cajun cook who learned at the elbows of many generations of cajun men and women like Adam’s great grandma. He says “you want it tik, not tin,” (If you don’t understand this then you haven’t been around any cajuns!) When we have fish, crabs, shellfish, etc. he saves the bones, shells, etc. and boils them in a huge stock pot. He then strains and freezes quarts of it to always have plenty on hand to use in the many cajun dishes for which it is required. As for making substitutions to try and “healthify” an authentic cajun recipe…………………..I don’t recommend it. To tamper with the true beauty and enormous flavor of these dishes is an affront to the person who chose to share it!y6 If you are worried about the ingredients being unhealthy, then cajun cuisine is probably not a good choice for you. GEAUX TIGERS!!!!!!!! Laissez les bons temps rouler!!!!!! Ahhh!! I made this last night! It was absolutely delicious. I’m currently eating the leftovers at my desk for lunch. I live in SC and have easy access to coastal shrimp. ‘Tis a great dish for Carolina shrimp! 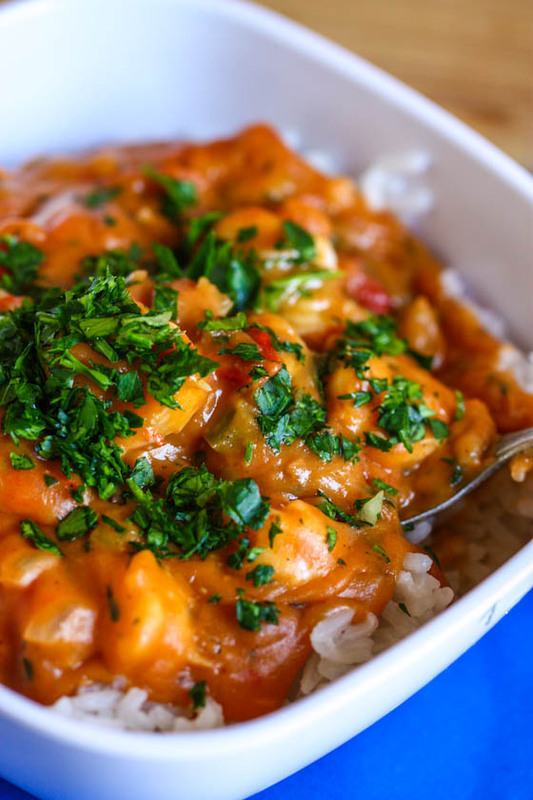 I have never had Shrimpt Etouffee before, but this looks amazing! My husband loves anything with shrimp and spice, so I know this will be a hit! Is that Cafe du Monde coffee I spot? I love that chicory coffee! Oh Jenna…First, let me say that EVERY single recipe of yours that I have ever tried has come out AMAZING!! Second, this one is no different 🙂 It was wonderful! I was planning to make your Engagement Scampi but when I saw this post while my Kindergartener’s were at recess I just knew I’d have to make an HEB stop after work to pick up some more butter and seafood stock!! It was wonderful 🙂 Thanks for all you do, yours is the only blog I read every day. Your recipes are amazing and you are such an encouragement in the way you live your life for the Lord and others!! Thanks so much for this recipe! Tried it and it was delicious. I was planning on making Gumbo since I missed Mardi Gras, but was putting it off because of how long it took to make. The etouffee was the perfect replacement! This looks so delicious. I won’t stop thinking about it until its mine. 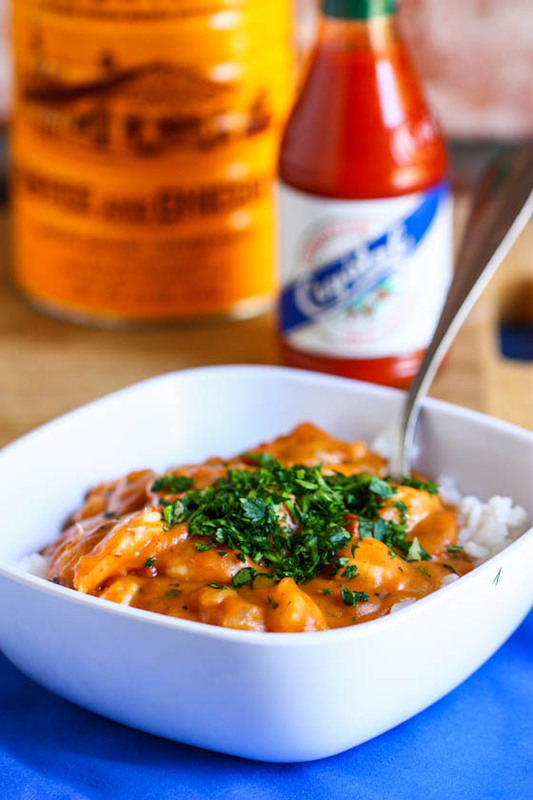 If you have leftover étouffée, (is that possible?) blackened a piece of fish, and serve it on a half a baked sweet potato with the étouffée spooned over it. Magnificent!! Inspired by the Catfish Mulate’s at Mulate’s in NOLA. Im the nice cute guy, although im not very aritacttve and girls dont get attracted to me but im not goign to be the a-hole just to get a girl. I want to be myself and get a girl but its hard to do that as myself. I say to them that I am aritacttve and hot and I really think that when I say it but I really know its not that. But I dont show it. This looks so delicious! My boyfriend went to Louisiana for Mardi Gras and came back with some yummy new recipes, but I think I will have to try this one out and surprise him. He loved the food while there, I think it would be nice to secretly make this for him. I hope I don’t have any trouble finding seafood stock! Yes! Just cut the rest of the ingredients in half and you will be good to go. It will be better (and more authentic!) with crawfish anyway! Oh I need to read better…I just saw that it said crawfish…thank you for this awesome recipe! I’m going to cut it in half because I don’t have enough tails! Can’t wait! I tried this tonight and found my dad sneaking extra shrimp out the pot!!! As a local Louisiana girl I can say this is the real deal!!! Kudos to your family for giving this recipie to you! Looks like I’m on the hook for making this again!!! I had some seafood stock in the freezer that I had made from the last big batch of shrimp I made. Tis was the perfect use for it. It was delicious but my étouffée was not the red color in the pics. It was more brown. Was I supposed to add tomato paste or something? Btw, I used half the butter and flour and it thickened up just fine! I made this for my boyfriend (an avid lover of Cajun food) last night and he looooved it!!! The recipe is very straight forward and easy to follow and it turned out perfect. Thanks so much for sharing! Finally someone who knows how to cook cajun dishes! I’m from Louisiana and this is exactly how I would do it. Butter/flour based roux. It’s funny reading some of these people from up north who write cajun recipes but have it completely wrong. Well done! And I love that you use Crystal hot sauce. 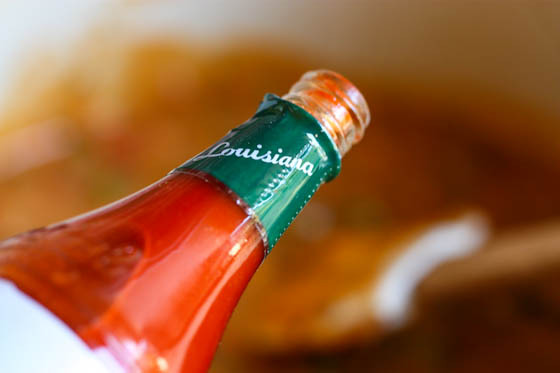 I do love Tobasco, but it has more vinegar in it than Crystal does. I have made this on three seperate occasions! It’s as amazing each time as the first, which I made untested for a dinner party and it was a huge hit! This is hands down my favorite recipe find ever. Thank you! just coming back here to say that we finally made it~ this past saturday. and the next morning, we served it over roasted potatoes and topped it with a poached egg. mmmmmm. WOW. I have been dying for some etoufee ever since a recent trip to New Orleans. This looks delicious! Just wanted to let you know that I just made this recipe for my family and they absolutely loved it. It was my first time ever making étouffée and your recipe gave me the courage to try it. It is a spot on recipe and its fantastic. I can’t thank you enough! Thank you! Thank you! Thank you! gosh this looks so awesome. I can’t wait to try it tomorrow! Ty for posting this. I really really appreciate it. WOW I have used this like 20 times and it’s the best. Thank you so much. I’m from Idaho and we never had such goodness like this. YaY! Thanks again! This is the best of the best of the best. This is a great recipe. 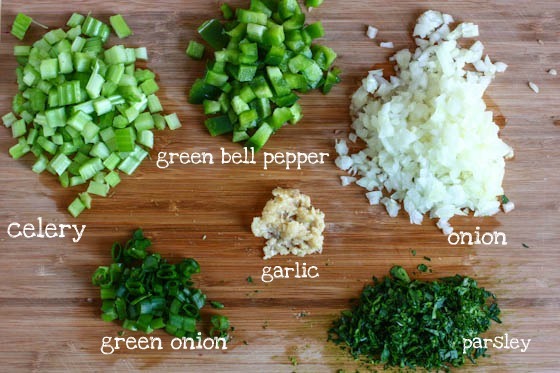 Pretty easy to make once you have all veggies chopped/cut. My family loves this dish. Definitely a keeper. It makes a really big pot, so half the recipe if you have a small family or only cooking for two. I have made this several times and its better each time.. I love it!!!! 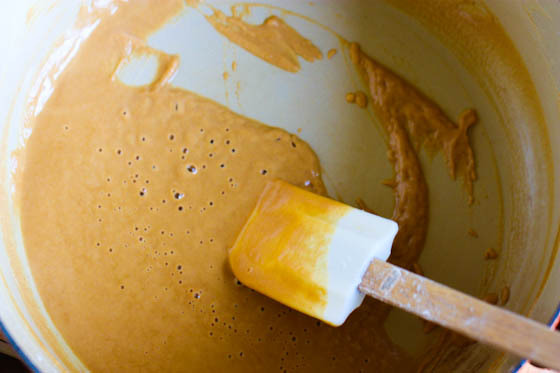 Hello, how long did you stir your roux to get it the color of peanut butter? I was stirring for 20 minutes and I still felt it was too light, but I went ahead anyway. Still tasted good in the end but it was lighter colored than yours. Also..what kind of pots do you prefer? Thanks, yummy recipe!! There was a local restaurant called Creole Cafe locally a few years back-and their Etouffee was fabulous!! I will remember all of the great meals we had there when I make your recipe! Thanks so much for sharing it! I’ve made this several times, it is a keeper! Today, I had it over grits. Wonderful! 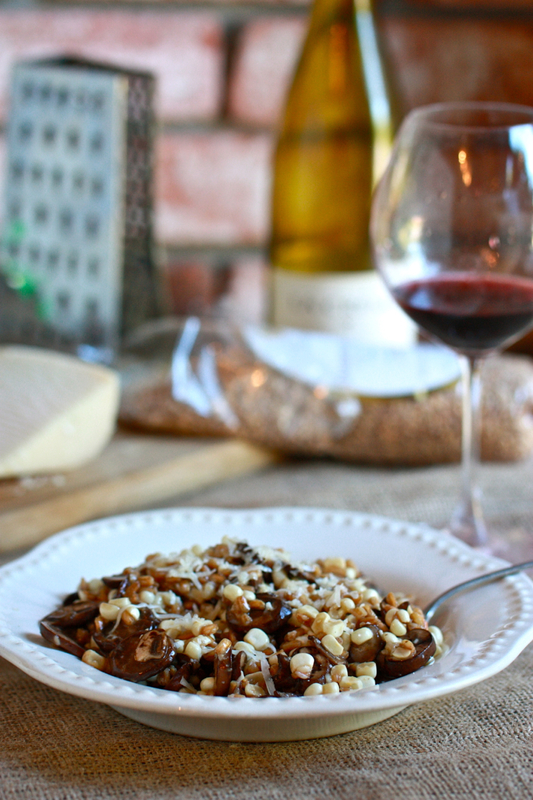 Just wanted to let you know that my husband and I have made this recipe our Valentine’s Day tradition (only the second year into this tradition, but I’m sure it will continue!)! It is so delicious and very fun to spend time making it together. Thank you for your wonderful recipes and lovely way of letting us into your life! Étouffée is a favorite in our southern household. It is my favorite way to cook and eat crawfish! I made this Monday night after seeing it pop up here. It was so, so good!!!! I was so sad that my leftovers were eaten yesterday. Thanks Jenna! YUM! It really doesn’t seem as complicated as I had thought. I’ll have to give this a try. Rice, on the other hand, is my sworn enemy. I don’t think I will EVER get it right.